Minimal Dialer is a clean looking dialer that keeps all the essentials of the basic dialer. It is made to be finger friendly with large buttons, which makes it a great utility for anybody with large fingers. It brings you enhanced graphics and redialing/smartdialing functions. 1. PdG Redial Enabler.cab is only redial. 2. PdG Smartdial Enabler.cab is redial and smartdial. First install one of the dialer cabs from developer�s website and then install one of the addon cabs. 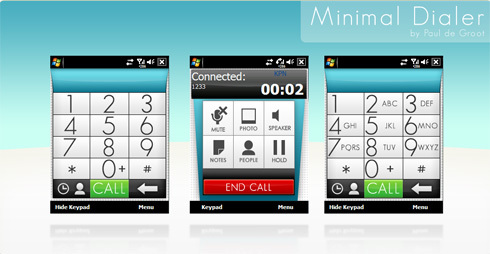 To revert back to original minimal dialer first uninstall the addon and then reinstall the dialer. this dialer looks perfect. can anyone help me, how do i uninstall the default dialer on my xperia x1? cant find it in remove program. Does anyone know if this will install on an HTC Touch Pro 2? The stock dialer has somewhat (and unnecessarily) small keys.